Discover the Four Questions that will forever transform your life! Byron Katie will teach you this revolutionary process so that you can use it to question and undo any stressful thought that keeps you from experiencing mental clarity. Discover the Four Questions that will forever transform your life! No matter how much money, status, professional success, or other types of external security one may have, very few people experience true joy and personal freedom. Byron Katie knows this reality too well. In the midst of a "normal and successful" life, Katie became increasingly depressed, and over a ten-year period sank further into rage and despair. Then, one morning in 1986, out of the blue, she had a sudden, profound insight into how the mind works. As a result, a bedridden, suicidal woman became filled with love for everything life brings. Katie developed a simple yet powerful method of inquiry, called The Work, that helped make this transformation practical. In this program, you will learn how to use The Work for yourself. You'll discover that, contrary to popular belief, trying to let go of a painful thought never works; instead, once you have investigated it, the thought lets go of you. The Work's four powerful questions and turnaround (which is a way of experiencing the opposite of what you believe) have transformed the lives of hundreds of thousands of people throughout the world. 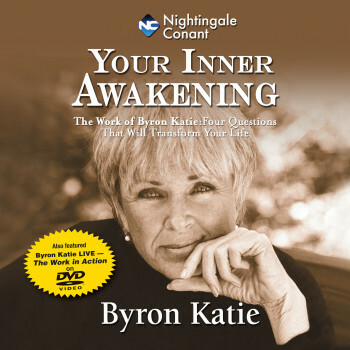 In Your Inner Awakening, Byron Katie will teach you this revolutionary process so that you can use it to question and undo any stressful thought that keeps you from experiencing mental clarity. Eventually you may find, as so many others have, that peace and joy flow into every area of your life. As Eckhart Tolle, author of The Power of Now, says, "Byron Katie's Work acts like a razor-sharp sword that cuts through illusions and enables you to know for yourself the timeless essence of your being."